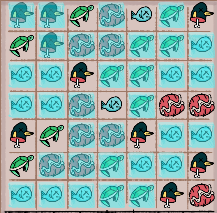 This is an interesting puzzle mechanic, but all the actual puzzles seem to just be "shoot whatever's closest to you." I feel like there was a lot of room for some creative level designs you could explore with this core mechanic, but everything's just really straightforward. There's nothing really wrong with the game. It looks very nice and controls well. There's just a lot of missed potential when it comes to level design. I did have fun with what the game is now. I just know it could be better though. Oh, sorry, I only ever tried to leave after everything was dead, and didn't notice the door was locked before that. It is really hard to tell where exactly the hit boxes are on the lasers. I had some fun once I read you comment about remapping the dodge button, but some more play testing could have really improved gameplay. Thanks for participating in the jam! This was certainly an interesting idea. I like the art style, but the spike blocks look like pickups because of that aura around them, so that was confusing on my first run. I feel like the camera should have been zoomed a bit further out. As it is, I can't tell what's coming up early enough to dodge it. And sometimes the game spawns things too late for me to dodge them. If that was changed, I think your game would be a fun challenge, having to bounce the player character up the tower rather than directly controlling them. That problem aside, thank you for submitting a unique idea. I'm glad I got to play it. (edit): I was was wrong. Didn't pay enough attention in my first play-through. Pretty good game. Thanks for making it! I like the game, but I feel like the game's design isn't really focused on it's core mechanic. The core mechanic being setting up traps and activating them. That's the main unique mechanic, it's in every level, and that's what the boss fight is testing you on. However, your score in the levels is judged by how many treasure chests you find, a task that can be completed without killing anything. Also, until the final boss, you only ever have to kill the game's first enemy with traps. In every other scenario, you can just sprint to the chests, then run to the exit avoiding everyone. The safest, fastest, and generally most effective approach is one that completely avoids using the game's main system. Sneaking past everyone is the main goal in Metal Gear, and the game is built around it. In your game, it's the main goal, but the core mechanic is centered around dispatching enemies. I like your game; it was fun and very well put together. It's just that your inspiration (MGS) and your unique ideas (Laser traps) didn't really line up with each other. You have a very interesting mechanic here and an even more interesting art style. The levels not totally resetting on death felt like a bug but seems to be a required mechanic for the level with the key activated death pit. It's strange when resetting manually is usually required after resetting by death but not always. It's an interesting decision asking the player if they want their death to just teleport them or reset the level, and it's one I don't think I have seen a game ask before. Strangely enough, I think that is your game's most interesting mechanic; running through a level, dieing, then running through again with your previous life's changes still in effect. I know that's not what your game is focused on, but it's what I felt was most compelling about it. Anyway, thanks for an intriguing game with an unsettling art style. I'm glad I played it. That was an interesting idea. Certainly very atmospheric, and the art is really nice. The swinging lamp is a nice mechanic, but the time limit stopped me from taking the time to maneuver the lamp to viewing the ground in front of me. Instead, I kind of just ran for it after the first couple deaths in the last room. I think you could make better use of this core mechanic if the player felt less rushed and the levels were somewhat randomly generated so I can't just memorize them (I know randomization is beyond what's possible in a 48 hour jam). The stairs were a little annoying, but the rest of the game played pretty well. Overall, this was an interesting game. Thanks for making it! You explain the rules on your game page, but since the game makes little sense without reading them (I had no idea what was going on in my first play through) you should really include those in the game itself. I think you need to give better feedback on what action I have taken and what effect it will have. Your combat system takes the action of the first button I press, but with no animation showing me I have locked in a move, it can be confusing when I change my mind and press another key and it still does my first action. I would change the currently chosen action's icon's color to indicate what the player has selected. You may also want to add an animation to the health bar to draw attention to the fact that someone is losing health. The game being turn based, I'm not sure why you included the timer. Although, I don't really get why normal 1v1 fighters have a timer, so there's that. Once I read how to play, I did enjoy the game. The art looks pretty good, and I like that you gave your two characters unique abilities instead of just being two people in a fist fight. Thanks for joining the Jam! You have made an interesting challenge here, though I don't really get the appeal of the pull option. It only seemed to kill me when I used it. Why do only the games with good music offer to mute the soundtrack? That's a pretty interesting core mechanic, and the twist added with flying enemies was pretty neat. Also, the whole game is very well presented. Shame you didn't have time to make more levels. I must admit, it took me until the room where you spawn on the morning star to realize only the spike ball actually hurts you. I was making things much harder on myself by dodging the chain too. I think you could base a full game off these mechanics. It would certainly be neat to see what new mechanics you would come up with to make every level a unique challenge. You made the controls really loose. I know that's how the original asteroids was, but in that game you didn't really need to go anywhere in particular. If you want the game to be more fun by requiring less precise movement, I would dampened all movement and rotation so if you stop turning or pulling space, your ship will come to a stop on it's own. I know it's part of the challenge having the ship conserve momentum, but it's just not very fun that way. Sorry most of this is just my opinion on game design. The game does look quite nice, looking somewhat like the next generation of the original graphics. And I like the mechanic where you have to pick up the core functions of your ship. It could be an interesting dilemma if I knew what all of them were going into each level and had to choose which was most important to get first. Anyway, interesting game. Thanks for entering the jam! It's nice to see a Godot game here. I must admit, I didn't really get it. I had a PS3 controller plugged in which seems to have permanently disabled keyboard controls, so I can't shoot. As everyone else said, the game does look very nice. This is an interesting concept. I feel like it could work well as a single unit in a Fire Emblem type game where one class just attracts AOE attacks. They could sprint behind enemy lines with other units piling on buffs so they can survive when the spells hit. Your game could have been more interesting if we could face more than 4 opponents, but as it is, I like it as a proof of concept. Thanks for submitting it! Hookshot games are always awesome, but I think yours is a little on the tough side. The genre is usually about gleefully flinging yourself through the air and that's what your adventurace preface made me think the game would be. Instead, it's a Super Meat Boy level precision platformer. I can't fault you for not making the game I expected. This is just a lengthy excuse for why I didn't finish your game. On the game design side, since you can't do anything while hanging from the wall, it would be nice if left clicking detached you from the wall and fired the next anchor point. Quickly hitting RMB then LMB is just unnecessary complexity when there is only one thing I could possibly want to do when clicking LMB. As for the hookshot mechanics, they actually work fairly well: giving a decent amount of swing while still taking you where you want to go. My only problem is that the level design generally seems to favor a Legend of Zelda style (straight to the target) style hookshot rather than the Spider Man style swinging one actually in the game. This leads to the aforementioned difficulty where spikes tend to be in the way of your swing when approaching your destination. Thanks for making this game. It is pretty good. This is just kind of my pet genre, so I'm a little more critical of hookshot-centric games. I like how upset your gun looks with this whole affair, and overall the art style is very nice. I'm sure half your development time was spent drawing unhappy wall blobs. Have you played the game Perspective from DigiPen, because this has a similar core mechanic to that. At the very least, your game is interesting for the same reasons that game was: the challenge of lining up your perspective to bridge gaps in a path on the wall. I had no frame rate drops and really enjoyed the game. Also, thank you for the excessive health allowance. I hate to shoot the panicking putty, but going back to the start for a few stray bullets would have been very annoying. It took me a second to figure out what I was looking at in that thumbnail, but I burst out laughing when I read the title and it finally clicked. I couldn't get blue lasers to fire, only red. The game was still fairly playable though. I like how the core mechanic is pretty much just aggressively asking people to get out of your way. Overall it was a pretty fun game, if not somewhat simplistic, and I enjoyed playing it. I must admit, I didn't really get it. What qualifies a puzzle as unsolved? Well that was surprisingly good! People will, as I just did, judge you for that default blue background. Always change the background color. That blue is a dead giveaway that you're new to Unity. And it's a shame no one else has played your game yet because it's hilarious and pretty challenging while still being fair. The bits where you had to jump up multiple platforms that were directly above each other and jumping off Matt were pretty fun. The last level especially was really well designed. I must admit Matt is a little unpredictable and unfair sometimes, but the rest of the level seems to have been very concisely designed with every jump perfectly possible but just barely so. GOD mode was a nice addition though I didn't beat it. Overall, you have made a very nice game, and I hope other people play it. Unity Note: You can fix the fuzzy text by setting the "Font Size" to something like 60, then just change "Character Size" to actually scale the text. You must rename "GolfGuy_Data" to "WedgeOfJustice_Data" to play. I feel like the game would have been challenging enough without the spikes. The game's concept is interesting, but the ball being replaced by a sleeping dude doesn't seem to effect gameplay at all. It would be annoying if he got up and walked around while you're trying to play, but I was expecting him to do something a ball wouldn't, like grabbing onto ledges or trying to stop himself from sliding. There's a lot of humor to be had in just animating a distraught little golfer being knocked around. I know animation might be a little much for a 48 hour game, but as it is, it's just a sideways golf game where the ball looks like a person. I liked playing your game. I just feel like you could have done a bit more with the core idea. "Do not shoot the enemies in this shooter. Find instead another way to kill them." I tried playing without reading that first and couldn't figure out how to dodge them all. This game gets pretty frantic once you're spawning groups of 2, and it's the only game I can think of where the correct answer to getting swarmed is to frantically look for the right colored wall. I actually really like the crisp, colorful art style you went with. It certainly serves the gameplay, but also just looks nice. In all, this was a very interesting idea for a game, and I'm glad you made it. Thanks! I also cannot make it past the title screen. Has anyone figured it out? Nicely made! My only issue is with it's brevity and not noticing shotgun guys took multiple hits to kill. There's honestly not a lot to say about your game. You seem to have known exactly what you wanted to make, then made exactly that. It controls well. It was a good level of challenge (though maybe setting me to 3 health at the start of every fight would have been better than 5 health that caries between levels). The art was exactly what was needed to tell the enemies apart. The music fit the visuals, and overall, it was just really well executed. It was a fun game. Thanks for making it! Well that was certainly interesting. It's definitely more strategic than a standard racing game: forcing you to only apply the gas at certain points rather than holding it down for 95% of the race. I must admit, I was never good at top down racing games, so I can't really judge how well this one controls. I like that you can park in front of another racer and they will just push you. Anyway, thanks for submitting it. I haven't played an entry in this genre in years, so it was nice to have a reason to play one. I have never before played a game where the edge of my screen is my main opponent. Perhaps dragging in the direction I want it to move rather than the opposite could have solved this. This is certainly an interesting idea for a game. I like that the character stops falling when you start lining up your next shot, but starts sliding again, so you can't just aim forever. I was hoping there would be some more challenging levels near the end, but otherwise the game is a good length for the mechanics it is showing. Overall, I enjoyed playing your game. Thanks for participating in the jam. This is an interesting idea. I didn't have anyone to play against though. This is a pretty interesting game and I really like it. I didn't really find anything wrong with the game, but I do have some suggestions. I think it would be more fun if the player character was a little more responsive. Maybe a dash move mapped to right click and a larger hitbox for the sword. Or maybe just give a little more space to work with, so I'm not constantly surrounded by enemies. You can always increase difficulty by spawning more or tougher enemies. I just feel like games are generally more fun when the difficulty comes from the enemy's power or numbers rather than my character's limitations. Regardless of my game design advice, you should really implement a timescale slider when you're testing this kind of game. When I made a twin-stick shooter, I found it really helpful to play the game at 10% speed to see exactly what timing I was requiring of the player and how much room I was giving them to execute moves. Anyway, really nice game. I just feel like it would be more fun if it had that bullet-hell feel of barely squeezing past a wall of projectiles. Some of those give you a 1 pixel hitbox and they're still really tough. I'm not exactly sure what was going on. I played enough to find the letter K, but never really figured out the controls beyond "you can teleport about 2 meters at a time." I do like the look of the purple skyline. It makes the game feel kind of alien. Buy 25+ food every turn. Are you guys trying to break my mouse? This is an interesting idea, an RTS where the only threat is the rise of the proletariat, but when it's this simple, it's really easy to never have any problems at all. Then it's just a game about a perfectly functional society. Your end screen tells me I am the Best, but After buying 250 food with 8 days left, I went to go microwave my dinner because there was nothing that could stop me from winning at that point. It's a nice enough game. I just think you chose a concept that needed more time to flesh out than you actually had available. There's just not enough going on for this to be an interesting game. Also, the turns are really slow. There are not a lot of decisions to make each turn. Certainly not 45 seconds worth. A minor problem that is partly my fault is that it took me 2 turns of random clicking to find the market. I really like the game's concept. It could add a lot to a game like Anno (which I haven't played). I just don't think the game's core mechanic stands well in isolation. This may have been mostly complaints, but I did enjoy playing the game. It has a nice art style, and I liked gaming the market: buying up crazy amounts of food when it was only 1 money each. Oh. I didn't really understand what made the board clear, so I just assumed it happened when I ran out of moves. Thanks for explaining why that happened. Your game has an actual ending! Very nice game. I like the art and music. The collides on the environment are a little tough to guess though. They were generally fairly forgiving which I appreciate. It's just, I would often be running where I though the trees should be blocking me. Anyway, nice game. I'm glad I could play it. That was definitely an interesting take on the theme. You really seemed to put a lot of work into the art, and the music fit fairly well. The gameplay though I did have some trouble with. A lot of this game is spent waiting for the next customer which is realistic but not really enjoyable. The game's not complicated enough for me to need this extra time to consider my options. The trades were also all really straightforward. I'm not sure how the concept could be made more strategic without building a lot more gameplay than 48 hours allows, but the whole game focusing on a single mechanic that boils down to mainly yes/no questions is just a bit too simple. I appreciate that you all actually built a story around your mechanics and you presented it very well. I just though the gameplay was a bit too simple. Not removing matches definitely adds a new dynamic to the match 3 genre. I like your art style and the game is pretty well executed. I just noticed the fish skeleton spells out FISH, so nice touch there. I don't usually like match 3 games but I enjoyed playing this one. Thanks for making it. That was a very strange game! The lack of checkpoints means I sadly won't be beating it. I got all 4 abilities then died when the two powerful ones both missed at the same time. I like that you are basically playing two games at once: one calling in attacks from above and the other dodging robots. It makes the game feel more frantic as you have to switch between them. It was pretty funny that you're only means of offense is dropping barriers, like your politely asking the robots to go away, and the car had a habit of flipping through the air when it hit an obstetrical which was pretty entertaining. You all drew quite a lot of models for this and the fire looks really nice. If I didn't have to restart from the beginning with each death, I would definitely finish it.